If you think of a NetEnt slot that is packed with gemstones then it is likely that you are going to think of the classic Starburst slot. That’s understandable given how popular this rather simple slot is with players, but there are actually a number of other games that have precious stones as their main symbols on the reel. One of these is the exciting Dazzle Me slot, which you can play right now at Leo Vegas Casino. It is also fair to say that the styling and game play of the Dazzle Me slot is a bit more involved than what you get on Starburst. The first thing that strikes you about the slot is that it is set up differently to most with a 3-3-4-4-5 reel layout and a total of 76 different pay lines in play across the reels. The pleasing thing though for players who prefer to play for smaller stakes is that you do not need to cover every single one of those pay lines with an individual coin. You can simply select your coin size (from £0.01 up to £1.00) and your wager is 20 coins, which covers all 76 of the paylines. That is good value for money when compared to slots that make you cover all lines with a single wager. You can also increase the size of your bet by using the Level indicator which goes, as standard on NetEnt slots, from 1 through to 10 and which offers a bet of between 1x and 10x the standard amount depending on the Level played. So play a £0.01 coin at Level 10 and that is £0.01 x 20 x 10 which is £2.00 per spin. This gives us a minimum wager of £0.20 and a maximum wager of £200 per spin. When it comes to symbols there are just six on the reels. There are four different gemstones as the lower value wins which range from 3 coins up to 30 coins and these are the blue, green purple and red gemstones. The two higher value symbols are the Bell and the Lucky 7 symbol and these offer wins for just 2 symbols on a pay line (of a single coin) but also offer wins of up to 100 and 200 coins respectively for five on a line. Those wins don’t sound so big but what you have to realise is that all the symbols are stacked on the reels in the Dazzle Me slot, so when you trigger a win, you stand a good chance of landing it across multiple paying lines and it is this way that you can land some of the massive wins in the game, rather than landing a single rare five-symbol win. There are other features on the slot which can assist you when it comes to landing the bigger wins available on the Dazzle Me game and we will take a closer look at them in the section below. The first key feature to note on the Dazzle Me slot is the Dazzling Wild Reels which appear at random in the base game and when they do, any reels that they appear on will turn completely Wild, offering you the chance to land multiple winning lines using multiple symbols on a single spin. Up to all five of the reels can turn Wild using the Dazzling Wild Reels feature and of course, the more that you turn Wild the more that you can win. Turn all five Wild and you can win the massive in game jackpot. There is no standard Wild symbol on the reels however, so you are reliant on triggering this random bonus to land any Wild at all during the game and that can mean that the game plays a little more tightly at times, especially when compared to games which do have one or more standard Wilds on the reels. Another feature on the slot is the Free Spins bonus game which is triggered when you land three, four or five of the Free Spins symbols anywhere across the reels. Land three and you trigger 8 free spins, four gets you 12 free spins and land all five to receive the maximum 16 free spins. During free spins you have the benefit of having a Linked Reels feature in play on each of your free spins. When this occurs any two reels from reels 1 to 4 become linked and they display the same symbols on the reels for that spin. This ensures that at least two reels match fully for the spin and if you can land the other reels with similar symbols, then you stand a much better chance of landing a higher value win. What is especially pleasing with the Dazzle Me slot is that there is a great range of wins you can enjoy. Sure, there are a number of lower value wins of just a handful of coins and these wins do not match the amount you bet on that spin. Alongside this however, you can also land some multiple 3 and 4 symbol wins across multiple pay lines which regularly pay out higher value wins and offer you a profit on that spin. Furthermore, triggering wins using the higher value symbols is certainly not as onerous a task as it is in some other similar slots. It is clear to me that NetEnt have realised how popular the style of gameplay is in their Starburst slot and have tried to offer something similar with Dazzle Me but with the addition of a new-look reel set and a free spins bonus game, which also has a decent feature attached with the linked reels. Even the Dazzling Wild Reels feature is somewhat reminiscent of how the Wilds are used in the Starburst game and that is no bad thing, although I would have liked to see this feature trigger a little more frequently than it actually does. Dazzle Me is a game which if you enjoyed the classic NetEnt slot Starburst, then you are sure to love. It is a bit more involved and doesn’t offer quite the same level of simplicity as a result, but the game is fun to play and the rewards are sizeable. It would have been markedly better though had the Dazzling Wild Reels feature triggered more frequently. 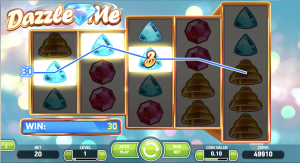 With an unusual number (76) of winning lines, a different kind of reel set up, a couple of intriguing features alongside a Free Spins bonus round, the Dazzle Me slot from NetEnt is packed full of features that you don’t ordinarily find on other slots. The game has all the high production values you have come to expect from a NetEnt game but packaged together somewhat differently to the norm. The result is a fun, playable slot that perhaps doesn’t quite grab your attention in the way that it should initially, but which grows on you the more you play it.